Our range of products include automatic linear bottle washing machine. Backed by sophisticated infrastructure and engineering expertise, we manufacture and export automatic linear bottle washing machines. 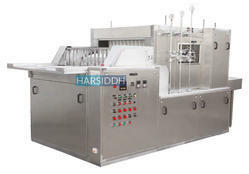 These machines are widely demanded in the pharmaceutical industries for the purpose of washing the bottles consuming less labor and time. Our machines are accurate in size and serve the application needs of clients for a long period of time. All contact parts with D.M. Water and distilled water of S.S. 316 construction and argon arc welded. All exposed parts are of S.S. 304 or hard chrome plated or brass for corrosion free long life. Fixed top nozzles at each washing station ensures external washing of bottles at the same time of internal washing. The flow of washing Medias stop during the indexing of chain, saving straight 25% on utilities. The system of solenoid valves and optional tanks, pumps and filters is engineered for long trouble free life & tool proof operation.